Melaka will always be known a historical city for its colonial past. Located by the southwest coast of Peninsular Malaysia, this state is more than just the famous demolished A Famosa building or Jonker Street Night Market. Look closely and you will be awed by the incredible architectures and great cultural influences that can be found at almost every corner. Getting in and out of Melaka is considerably easy when you take the bus these days. Delima Express is one of the many bus operators that been serving travellers in Melaka for more than two decades already. Since then, the company has been progressing with technology and you can finally book your bus ticket online through Easybook! 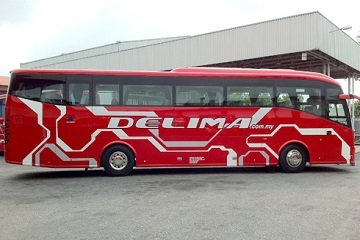 Delima Bus is considered one of the longest-serving bus operators available in Melaka until today with routes travelling from Melaka to Kuala Lumpur, Johor Bahru and Singapore, as well as return trips from the mentioned places. Now that Easybook can be accessed anytime and anywhere, there is no need to go through the trouble of leaving your house just to purchase Delima Express bus tickets. 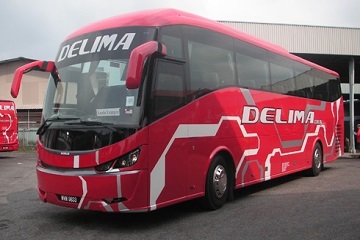 Besides having an office in Melaka, Delima Express bus have also crossed the border to serve the neighouring country by having an office at City Plaza in Singapore. It is conveniently located just a mere walking distance from Paya Lebar MRT station that is close to the Geylang area, as well as the East West MRT Line and Circle MRT Line. Now anyone can ride with Delima Express! Besides City Plaza, you also board the bus from Woodlands in Singapore. Riding from Melaka to Singapore takes approximately 3 hours and 30 minutes. If you are travelling from Melaka, the pick-up point would be from the Melaka Sentral Bus terminal that is surrounded by plenty of shopping complexes for your convenience. Otherwise you are still able to shop and grab a bite over there while you wait for your bus to arrive as well. For those travelling to Johor, Delima Express bus stops at Larkin Terminal, which serves as the city’s largest and main stop for various transportations. This route takes about 3 hours and 30 minutes. 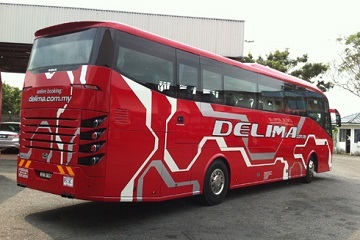 If you are travelling to or from Kuala Lumpur with Delima bus, the amazing Terminal Bersepadu Selatan (TBS) would act as the meeting point for both pick-up and drop-off that is strategically easy to get to your exact location. Melaka to KL would take approximately 2 hours to arrive. Whether you are planning trips to either enter or exit Melaka, you can easily book your bus ticket for Delima Express here at Easybook within a few minutes. You can book anytime that you desire, or purchase it at the palm of your hand when you download our mobile app to your devices. Let Easybook start the next journey for you today!